Don't miss out on the Spring 2019 outdoor season! We're open and collecting registrations. If you have a full recreation team you'd like to bring in, give us a call and we can set something up. If you have a travel team that wants to play with us, connect with us by phone as well. We can help with budgeting and transfer for the Fall. Spring season travel teams are set. Click here to register for all of our regular programs. We have served Damascus, Clarksburg, Germantown area for 31 years! We're sanctioned by the State, run an in-house league, Select Travel programs through NCSL and EDP, and co-own two major tournaments: August Cup and Rush for the Cup. Our mission of promoting Character, Development, and Fun Through Youth Sports has resonated well in our community for a long time and we've turned out some really great adults as well as athletes. This is what we do and why our not-for-profit 501(c)3 exists. Join us for 8 weeks of play in an affordable, family-friendly setting. Help us promote teamwork, respect, sportsmanship, empathy, and more in our efforts to help the good citizens of tomorrow be the best they can be. 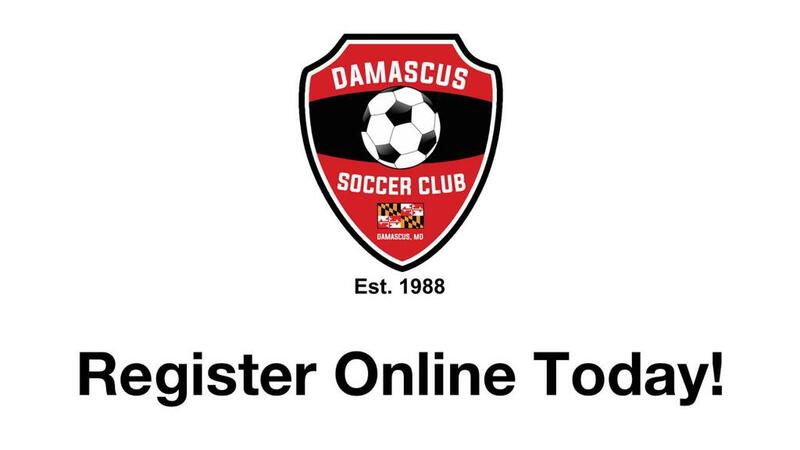 Damascus Soccer Club (DSC) has been serving youth and their families in our community since 1988. Club players from 34 schools come together on our fields and indoor facilities for three seasons (Fall, Winter and Spring) every year to learn, play, and absorb the lessons of character development through sport. Our three programs include Academy (ages 3-8), Recreation (ages 9-18) and select travel (played through NCSL ages 10-18). Ours is a homestyle, grass-roots program, lead mostly by community and parent volunteers. Many of our volunteer coaches are licensed, accredited, certified and/or hold diplomas from NSCAA, NFHS, or US Soccer. The Damascus Soccer Club is a 501(c)3 not-for-profit organization who's culture emphasizes development over entertainment. What do we mean? We mean that we only get one chance at raising our kids. For us, that means 15 solid years of opportunity - from 3 years to 18 years old. - to positively affect the way our kids interact with the world around them. Youth sports brings a lot of value into our kid's lives: fitness, fun, healthy habits, good nutrition, time with family, excitement, and more. Youth sports helps kids become well rounded, team-oriented, adults. Youth Sports gives us the gift of thousands of teachable moments. Win, lose or draw, kids get to experience victory and defeat. They see first hand the benefits of sharing and working with others vs being selfish. They get to experience the value of work ethic & the differences between people who put in the time to improve vs the ones who don't. They form friendships outside of their regular school or neighborhood groupings - friendships that share the same values, and can not only help them get through difficult times but may last a lifetime. Youth Sports exposes kids to responsible and volunteer-oriented "good citizen" adults. As parent volunteers, we show by example what it means to contribute to our community and give back to the generations that follow us. The Damascus Soccer Club sponsors a weekly podcast that was made to bring parents, players, and coaches together around the stuff that matters in youth sports. Subjects like Integrity Through Youth Sports, Empathy Through Youth Sports, Making College Affordable, Systems of Play, Making Training Age Appropriate, Reading the Offsides Foul, and Moms and Dads Can Coach, but Should They? are just a few of the subjects our Club President, David Dejewski, discusses on this show. Some of the best discussions we've had have been with parents, players, and coaches on the sidelines of a soccer field. Listen in here for some good sideline discussions.